I have had a NF-A4x10 FLX installed on hot end for a couple months and just installed a NF-A4x20 FLX fan installed on the part cooler. I would send M106 (via OctoPrint) and the part cooler would not turn on. I switched the fans at the board connection at the hot end and could get the A4x10 to run fine with M106. A4x20 would turn on fine when connected to the hot end connector and the hot end got over 60C. Both fans claim the same power consumption as per the sticker on the fan and specifications on the web site, which are significantly lower than the stock part fan. I noticed that when I sent M106 to the A4x20, it would wiggle a little, and if I pushed it, it would spin, but not nearly as fast as it should. 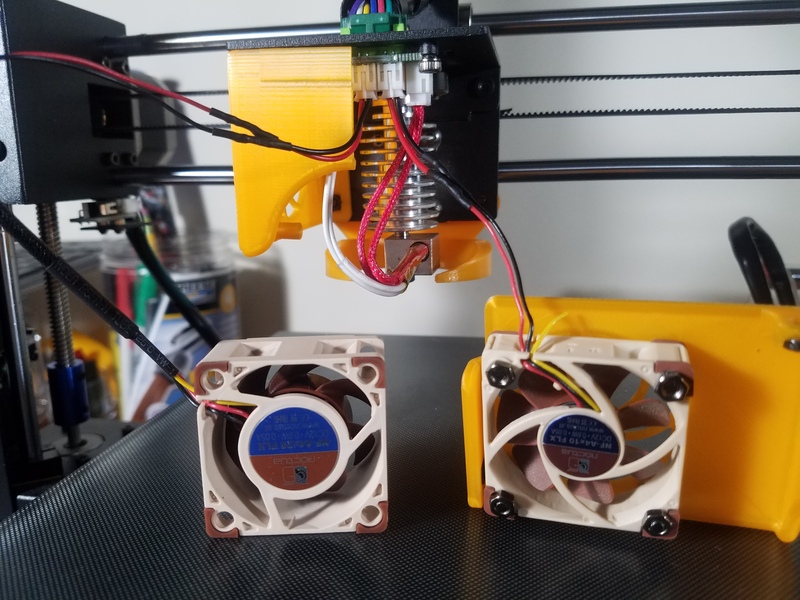 I installed the 12 volt firmware mod found here: https://www.thingiverse.com/thing:2732424 with XLoader and get the same results. Any suggestions on what is going on or what I can check is greatly appreciated. I didn't have any 2mm JST, so I ended up cutting the connector off the stock part fan and soldering it to the wire on the new A4x20 fan. I ordered some but they will not arrive until the 3rd. I'm not going to cut the connector off the new fan to see if the old fan works still, but I will put a new connector on the old fan when they arrive. Update: I checked the voltage and I thought it said 9.3. I went to check again, and got 11.5. Problem is now, the fan is on all the time. Can't turn it off. Is it possible something happened if accidentally shorted the circuit with the probes? I even made sure to flash firmware again to make sure something didn't accidentally get saved. Do you have a volt meter? Could always test what the output is to see if maybe there is a loose connection at the side of the printer, or if you've done any modifications inside there's always the chance a connection came loose there as well. I do have a volt meter. I will try to check. I had read somewhere that you do not want to turn the fan on without it connected because it will burn out a resistor on the board. Tricky part will be getting the probe in there at the same time as the connector. I still don't understand why one fan will work and the other will not. I have the exact same issue. Difference is i was trying to hook up a 2w laser via ttl and I definetly turn the speed up without anything connected. I have double and tripple checked the hotend pcb and the mainboard but havent found anything burnt. How did you solved this??? I never really determined what was wrong with my fan, if anything, but I did end up having a blown transistor. You can't really tell from looking at it though. Pretty simple to check, you just need to determine the pins on your transistor and check resistance. https://www.techwalla.com/articles/how-to-test-transistors-in-a-circuit. If you are not good at soldering, this may be difficult to change, I recommend getting a good soldier sucker. Once I got the transistor fixed it worked, but I ended up putting that board in my 2nd printer and have only printed ABS with it so far.